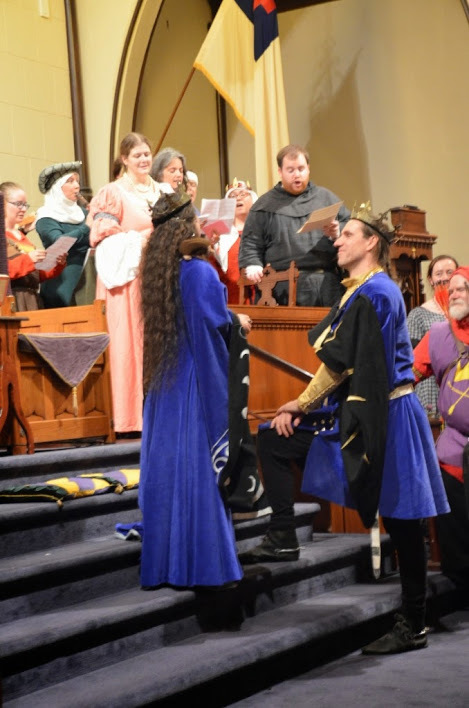 The song was performed by Lord Martyn de Halliwell, Mistress Aife ingen Chonchobair, Maistre Lucien de Pontivy, Baroness Ysmay de Lynn, Lady Aildreda de Tamwörthe, Lady Isabeau d’Orleans, Lady Violet Coleson, and Lady Katrin Daans. Baronne Sabine de Kerbriant and Lady Margretha la Fauvelle accompanied the singers on recorder and citole, respectively. There is a buzzing sound at about 0:18 in the video, the sound returns back to normal following. The lyrics are posted below. In forty years and nine there was a virtuous Queen of Eastern lands and patroness of flamingos and mighty hedgehogs. Her Prowess is unmatched with a bow, her arrows fly through the sun-filled sky she inspires all to fight for the East and noble creatures small and great. Her Loyalty and Faith show that her will is strong as any Royal Peer’s She inspires us to day to sing and praise her forevermore. Her Generosity and Mercy are well known throughout the Known World King Edward did repent and she forgave so we sing of her virtues for you today. Thyra’s Courtesy abounds even now for all to see and hear She’s not kicked me right out or banished me for these words that I have penned. Queen Thyra couteous Queen of the East we sing to day so all might know this Eastern Rose’s great display of noble virtues. Photo by Lord Sergei Rozvad syn, video courtesy Lady Ella de Caley, sheet music and lyrics courtesy Lord Martyn de Halliwell. The Barony of Bhakail and the Shire of Hartshorn-dale are pleased to announce El Cid – The Event taking place November 9th, 2013 in Center Square, PA. Enjoy a day full of performance as bards from many lands present the glorious tale of El Cid. Musicians will perform, and tempting food will be provided all day. The event theme is based on the court of Alfonso X, king of Castile during the later half of the 1200s. This was a time of peace and prosperity in the Iberian Peninsula, where Christians, Jews and Moors lived and worked side by side. The event website includes suggestions for attendees to help represent these different cultures. Also included on the event website are several articles of background information on El Cid and the music that will be performed throughout the day. There will be two different experiences available to event attendees. Those wishing for a more luxurious experience are invited to purchase the Above the Salt option which will include a reserved lounge with special treats, and guaranteed front and center seating, as well as a special thank you the day of the performance. Regular Patrons will still be treated to the same wonderful performance and delicious buffet-style food, and will receive a painted tile token and printed program. In addition, the event will offer several of the ambiance items (lanterns, hassocks, side-tables) for sale to those interested. Details about these various options are available in a special brochure. The CD of the Known World Choir and Friends at Pennsic 41 (2012) is now available! For the fourth year, Master Li Kung Lo has recorded the Choir’s dress rehearsal and produced a CD of their full programme. The CD is offered at cost ($4) to members of the Choir and all other interested parties. This year’s Choir was directed by Master Robyn Solarius, with one piece guest-directed by Mistress Eliane Halevy. The smaller Chorulus Pennsicus performed one song under the direction of Mistress Arianna of Wynthrope. All four CDs can also be purchased at A Market Day at Birka from Kellswood Krafts. Musicians’ Day in Ostgardr was cancelled earlier this year due to the site losing electricity and running water when a winter storm hit the week after Hurricane Sandy. The site and almost all the teachers originally scheduled for the event are available on January 26, so the event will be happening on that day! Te Regem for use in an SCA coronation ceremony. up to the one used for Elizabeth II.